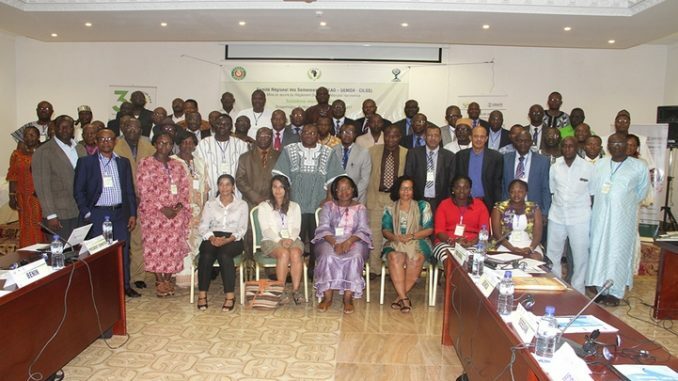 Ouagadougou, Burkina Faso, The Regional Harmonized Seed Regulation (ECOWAS-UEMOA-CILSS) is at the heart of the work of the third ordinary meeting of the Regional Seed Committee, launched on Wednesday 28 June 2017 in Ouagadougou, the capital of Burkina Faso. More than 75 people, representatives of the national seed committees of the 17 states of the ECOWAS-UEMOA-CILSS area, representatives of the Commissions of the ECOWAS and UEMOA Commissions, the CILSS Executive Secretariat, producer organizations and The private sector, as well as representatives of international organizations working in the seed sector will exchange for two days on the actions of the Regional Committee for Seeds, ECOWAS-UEMOA-CILSS. The objective of the meeting organized by the West and Central African Council for Agricultural Research and Development (CORAF) is to share the successes but also the problems encountered in the implementation of the Harmonized Regional Seed Regulations in this Community area comprising 17 countries Including 15 ECOWAS countries plus Mauritania and Chad. The meeting chaired by the Chief of Staff of the Burkina Faso Minister of Agriculture and Hydraulic Development will make it possible to take stock of the implementation of the Harmonized Regional Seed Regulation, both by the Member States and by the Commissions of ECOWAS and UEMOA and the CILSS Executive Secretariat. The meeting will also review the status of implementation of the recommendations of the Second Ordinary Meeting of the Committee held in Bamako, Mali, on 29 and 30 August 2016. In addition to these issues, the Committee will invite the Fertilizer and Pesticide Institutions to share with participants the state of implementation of the Regional Regulations on Fertilizers and Pesticides, including the setting up of Committees Regional Committees, namely, the Regional Committee on Fertilizers and the Regional Committee on Pesticides.